"By order of Judge Chytraus members of the Greek Church held an election yesterday, and the feeling between the rival factions became so bitter a riot resulted. 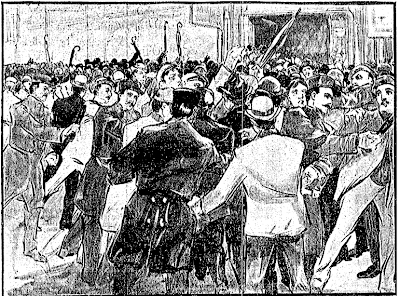 A patrol wagon filled with policemen was sent to the scene, but it was only by vigorous use of their clubs that the rioters were dispersed. The ballots will be counted tomorrow"